C-Line's largest pin badge features a attached pin for easier and quicker use. Name badge goes on straight and stays straight during use. Pin point is guarded while in use to eliminate the problem of snagging your clothing. PVC-free poly badge is top loading. Laser/Ink Jet inserts included. Built-in templates in Microsoft Word and Corel WordPerfect. 4 x 3. 100/BX . 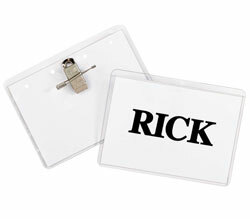 Replacement inserts let you use your plastic name badge holders over and over.